Looking to calculate a mortgage payment on the fly? 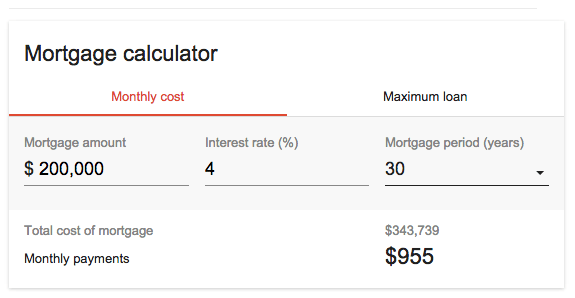 Instead of searching for a mortgage calculator using Google, you can now do some calculations simply by typing a query in the Google search box on your browser. Yesterday, the search behemoth launched the shortcut and it’s already visible when using Chrome, Google’s browser, or if using a private window via Firefox. It can also be accessed from a mobile phone. In a nutshell, it allows you to plug in a loan amount, an interest rate, and an amortization period without visiting any other websites. It instantly spits out the monthly payment and the total cost of the mortgage as you enter the numbers. You can also see the maximum loan based on monthly payment. For example, if you pop in $200,00 for the mortgage amount, 4% for the interest rate, and select 30 years for the mortgage term, you’ll see $955 for the monthly payment. It’ll also display the total cost of the mortgage, which in my example is $343,739. That figure includes the principal balance and the interest paid throughout the 30-year loan term. But it doesn’t tell you what portion is interest, though you can easily subtract your loan amount from that total to figure it out. Any variation of those types of queries will result in the mortgage calculator being displayed in Google’s search results, as pictured above. From there, you’re able to shuffle the numbers as needed to fine-tune your query. The obvious benefit of this tool is that you no longer need to go to another website, which could save some time. However, the tool is really only a very early starting point because it lacks important information such as the property taxes and homeowners insurance that must be paid in conjunction with a mortgage. For some loans, you may also need to pay private mortgage insurance and that should definitely be factored in to determine affordability. As I pointed out in an earlier post, without these items, your total housing payment may appear a lot cheaper than it really is. So this is more of a keyboard shortcut than a full-fledged solution at the moment. It may just be the beginning though. My guess is that Google is testing the waters and will eventually add more options so it can compete with other more robust financial calculators in its own search results. It also paves the way for a potential advertising slot or two if lenders can integrate their offerings into the tool. Read more: Is Google About to Replace Your Real Estate Agent Too? 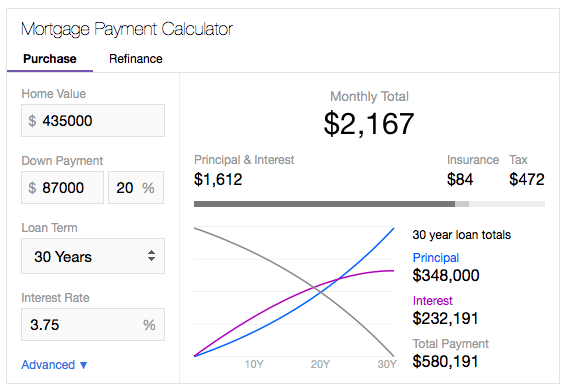 Just two months later, Yahoo has also launched a mortgage calculator within its own search results. And it’s a bit more robust than Google’s version. By default, it displays the total interest paid throughout the loan, as well as how the loan is paid off over time, with interest dropping over time as principal payments rise. Users also get monthly tax and insurance estimates, which can be fine-tuned if they know the actual numbers. However, advanced search queries don’t seem to bring up the tool at the moment.